If I have zucchinis in the kitchen all is right with my world. I just love their buttery flavour. Zucchini complements many different ingredients so it’s easy to grate, slice or chop them up, add a few simple pantry items and voila, a delicious dish of food. You can stuff zucchinis, saute them in oil, stew chunks of it in tomato, bake, barbecue or eat them raw. They make moist cake, a pate style spread, moreish (and Moorish) fritters, soup, piquant pickle, or as I have here, a yummy savoury tart. I think they are the most versatile of all vegetables. I can always create a meal when there are zucchinis in the fridge. I’ve posted a recipe before that uses Jane Grigson”s fabulous oatmeal crust from her 1979 Vegetable Book. It’s a recipe that translates well swapping the wheat flour for spelt. It’s a robust crust but with a delicious biscuity mouth feel and sweet nutty flavour, perfect with the subtle flavour of zucchinis. The oatmeal pastry a bit tricky to handle but it’s also forgiving. It patches easily if it tears while you’re lining the flan tin, so don’t be deterred. For my tart I sliced the zucchinis thinly on my Japanese mandolin. I lightly salted the slices and left them to drain for 30 minutes while I did a few chores and prepared the pastry. After rinsing the salt from the zucchinis I spread the slices on a clean tea towel to dry. This is an important step in their preparation. No one likes a soggy tart. 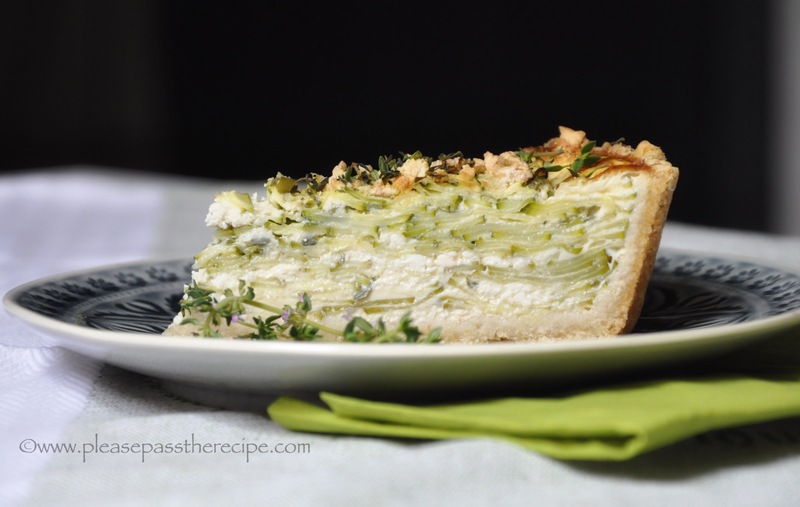 I wanted a tart that was dense with zucchini, a tart that was more vegetable than egg custard so I layered the zucchinis into the pastry base thinly, added a little custard mix and topped them with a scatter of thyme leaves, fennel seeds, lemon zest, black pepper and crumbled feta. When the tart base was full to the brim, I baked it for an hour. My zucchini tart is best cut when warm rather than piping hot. Measure the oats, spelt flour and salt into the bowl of a food processor and blitz to combine. Add the butter and process until the mixture resembles coarse breadcrumbs. Add the egg to the flour and process only until the pastry forms a ball. Very lightly knead the dough to bring it together then chill for 30 minutes. Lightly dust the bench and rolling pin with spelt flour. Roll the dough out into a round 2-3mm thick. Slip the dough over the rolling pin and into the flan tin. Because the dough has a coarse texture you need to push into into the grooves of the tin. Cut it off level with the top edge*, push it into the angles and edges, mend any tears. Using a mandolin, very finely slice the zucchinis into a colander. Sprinkle the slices with salt as you finish each zucchini. Leave to drain for 30 minutes. Rinse the zucchini slices, then spread them on a clean dry tea towel. Pat them dry with a second tea towel. Whisk the eggs and cream together lightly in a jug. Lightly sprinkle the base of the flan with thyme leaves, finely grated lemon zest, whole fennel seeds and feta cheese. Top with a thin layer of zucchini slices and moisten with a couple of tablespoons of the custard mixture. Continue layering until the pastry case is full, finishing with a feta cheese layer. Bake until the tart is golden brown and it feels firm in the middle, approximately 1 hour. Allow to tart to cool for at least 30 minutes before cutting. *The excess dough can be used to line small tart dishes and frozen until needed. What a gorgeous tart! I love that it is generous with zucchini, and I can imagine how nice it tastes with the lemon, fennel, feta and thyme. Pinned, what a lovely addition to a summer buffet lunch. So lovely to serve guests. I have all those things on hand. Must give this one a go. Pinned and trying as soon as the first zucchinis are ready in the garden! This looks incredible and has all my favorites, zucchini, spelt, feta, thyme. I am drooling just looking at it. I too am in love with zucchini so I second this, every delicous bite. Please send me a slice of this green bejewelled tart. You have made me hungry Mrs R.
I have always had the same love affair with zucchinis as you and in spite of having made a big pot of ratatouille yesterday have enough to try this. Am not a baker, but that rolled oats crust I would like to try soonest and the whole looks so appetizing I almost feel like going into the kitchen at nearly 10pm 🙂 ! Do like the extra touch of fennel seeds also . . .
How lovely. I will be trying this soon, thank you. I shall try it sometime! This entry was posted on March 15, 2016 by ladyredspecs in Baking, FODMAP diet, Food, Light Savoury Dishes, Main Meals, Savoury Baking, Vegetarian and tagged Fodmap, FODMAP diet, low fodmap, pastry, quiche, savoury tart, seasonal, summer, zucchini.